Highway Code app is launched | What Car? 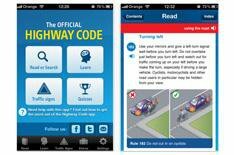 A Highway Code smartphone app has been released to help users improve road safety. The app was launched by Transport secretary Justine Greening, and is compatible with the iPhone, iPad, and iPod Touch devices. However, it's not available on phones running other operating systems, such as Android. Features on the app include the complete contents of the Highway Code, along with interactive functions such as quizzes, a stopping-distance calculator, and a tool to help identify road signs. Justine Greening said: 'With more of us using smartphones and other devices it's vital that products such as the Highway Code adapt to be as accessible as possible. The Highway Code app costs 3.99 and is available through the iTunes Store. For those using other operating systems, the Highway Code can be viewed for free online. A spokesman for the Driving Standards Agency said that it 'may look at rolling out the app to Android and other platforms in the future'.